Seeing a drawer full of over-ripe frozen bananas in the freezer the other day I decided that it was high time that I put them to use. As we’re trying to have a “healthier” January I decided against any of my usual Banana Cakes and set about searching for something suitable. After a quick flick through The Classic 1000 Recipes (Foulsham 1992) I came across a banana cake that looked really healthy as it had no sugar, dairy or eggs in it. For extra flavour I decided to use spelt wholegrain flour and a little maple syrup as well as using walnuts which I think pair well with bananas! This is not a cake that will rise as there is no raising agent and therefore the texture is dense and similar to bread pudding with a crispy outer surface when first baked. Packed full of nutrients I really think this cake ticks all the boxes. 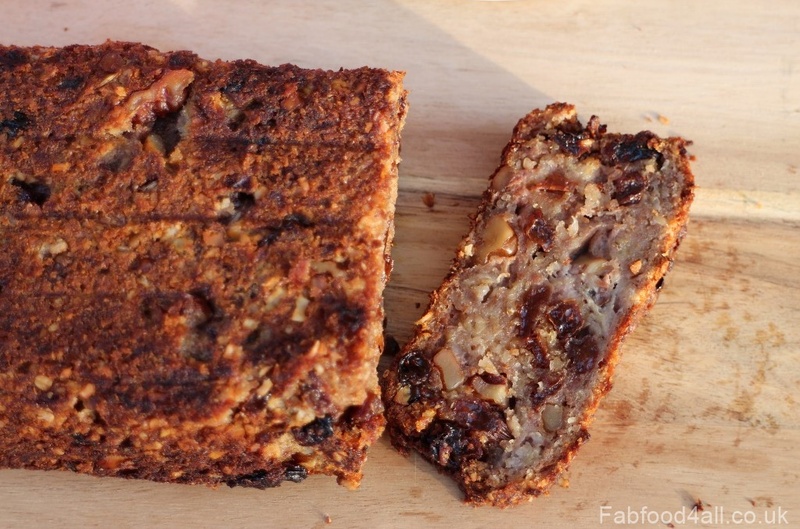 It was great to use up some of the walnuts and raisins left over from Christmas too! The only one in our family who didn’t approve and wouldn’t even try it was my daughter. She just won’t eat raisins but the rest of us enjoyed it and I had my parents over for a cuppa today and they really enjoyed it too. I asked a few bloggers for their healthy cakes which were either eggless, sugarless or dairy free and here are their suggestions: Egg Free Dairy Free Carrot & Cinnamon Cakes from Blue Kitchen Bakes, Vegan Vanilla Cake from Tinned Tomatoes and Egg and Dairy Free Spiced Apple & Raisin Cupcakes from family-friends-food. 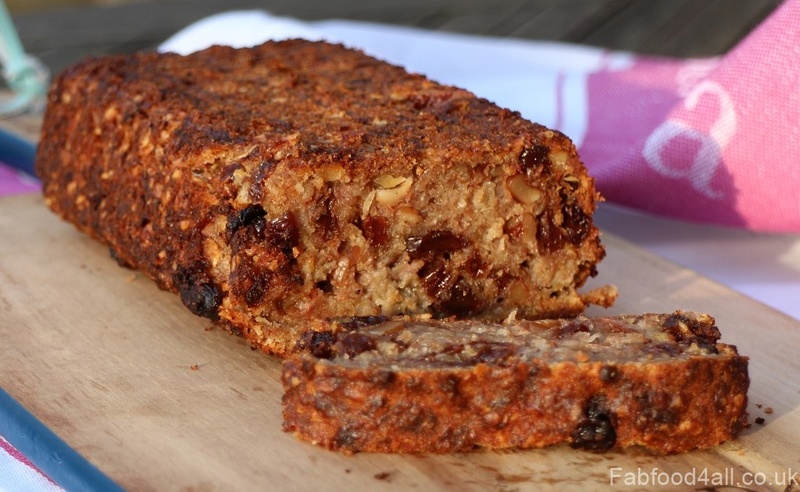 A Vegan Banana Cake which is sugar free and packed full of healthy walnuts, wholegrain spelt flour, oats and raisins with a dash of maple syrup. Grease a 450g/1lb loaf tin. Tip the mixture into the loaf tin and level with a spatula. Bake on the middle shelf for 55 – 60 minutes until cake springs back to the touch. Leave cake in the tin for 10 minutes and then cool on a wire rack. As this Vegan Banana Cake used up a heap of over-ripe bananas I’m entering it into Credit Crunch Munch which I run with Helen at Fuss Free Flavours. 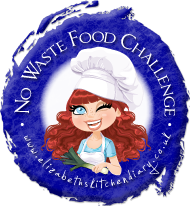 I’m also entering No Waste Food Challenge run by Elizabeth’s Kitchen Diary. Finally I’m entering Bookmarked Recipes over at Tinned Tomatoes. 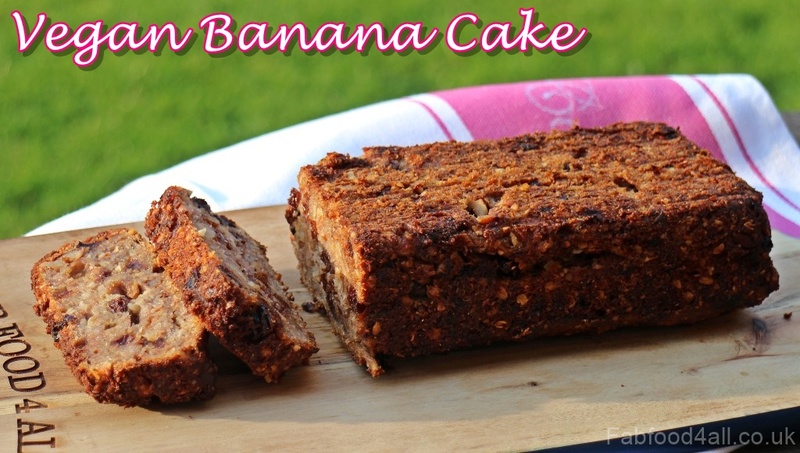 our family banana bread had no fat in it but does use eggs, funny how the recipes differ but are equally delicious!